Ever since I tried my first spoonful of Rice Krispies I have been a Kellogg's fan. I recently became part of the Kelloggers Network which means you will see many more posts about their awesome products in the months to come. I love that all the items are tasty, low in calories and essentially time savers. It's like they know how difficult it is for Hannah and I to get out of the door some mornings and that sometimes, you are just stuck eating on the go...or in my case, not until I get to my desk. Now I can enjoy a Special K Pastry Crisp versus getting a donut. The pastry crisp is healthier for me, and for my wallet. Open to Canadian Residents (excluding Quebec) who are the age of majority only. Valid entries only. Contest ends March 10, 2014. For further contest rules, refer to the Terms and Conditions within the Rafflecopter. nutra grain fruit crunch apple cinnamon cause its looks deliscious! Special k chocolatey red berries. It would be a decadent treat just for me! I'd like to try those shakes in the photo. I wasn't aware of them before and I'm going to look for them. Those pastry crisps sound great. I want to try them all. The Cracker Chips look great! I want to try the salt and vinegar cracker chips, because they look tasty and yet healthier than standard potato chips. I'd like to try the Special K Pastry Crisps because I have a sweet tooth! Special K Chocolately Red Berries Cereal because it sounds delicious with the berries. I would love to try the Pastry Crisps because those flavours sound delicious! The Special K Cracker Chips look great! I'm most eager to try the Chocolately Red Berries Cereal because I love cereal but don't buy it too often since it gets used up so fast. 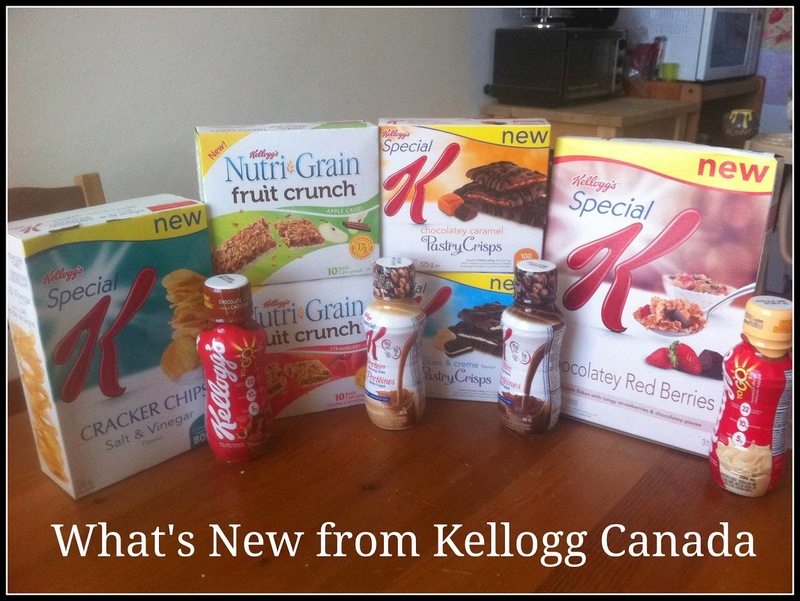 I want to try the Special K Pastry Crisps because I love there fruit crisp and I love anything sweet. I'd love to try the Nutri Grain Fruit Crunch bars. The cracker chips because the flavour appeals most to me! The pastry crisps sounds wonderful! I'm most interested in trying the Salt and Vinegar Cracker Chips -- I'm a sucker for anything salt and vinegar! I really want to try the Pastry Crisps. The cracker chips are already a huge hit with us the girls. The pastry chips because they look so delicious! I want to try the pastry crisps,,cookies and crème..yum,,they looks soo good! I most want to try the Special K Cracker Chips because I love my munchies and I love them even more when they're healthy. the cafe latte breakfast shake. mmmm. sounds good. I would like to try the Kellogg's Nutri-Grain Fruit Crunch bars in Strawberry. It sounds like a nice treat, and I will enjoy that it is crunchy and fruit filled. I would like to try the Kellogg's Nutri-Grain Fruit Crunch bars in Strawberry. They sound like a nice treat. I like that they are crunchy and have a fruit filling....a change from the traditional granola bar. The pastry crisps sound unique and great! Would love to try the salt and vinegar Cracker Chips! I am most interested in th fruit crunch bars because I am always trying to find tasty healthy snack bars. I'd most like to try the Cookies and Creme Special K Pastry Crisps. I've tried their other types of pastry crisps and really liked them and the flavour combo sounds like it would taste great. The salt and vinegar cracker chips are a must try for me as I love chips and would appreciate a healthier alternative! I'd love to try the Chocolate Breakfast to go shakes. Would love to try the Special K Cracker Chips (Salt & Vinegar Flavour). Love s&v chips. I'm all over the salt and vinegar chips! I want to try the chocolate pastry crisps! The pastry crisps, because they sound delicious! The pastry crisps because they sound delicious! I would love to try the pastry crisps, I love the fruit ones and these new ones look so yummy! The Kelloggs' To-Go Shakes because they would be great for a grab-and-go healthy breakfast! Their breakfast shakes would be great to try. I need healthy "to go" breakfast options. Special K Chocolately Red Berries Cereal is a must try for me. I'd really like to taste the Cracker Chips in the Salt & Vinegar flavour as I have never tried them before (their other flavours) - and I enjoy chips in general. I want to try the protein shakes! They'd be great to grab on the go when I'm heading off to work. I would most want to try the Kellogg's TO GO Breakfast Shakes. I am not a breakfast eater (bad) and I know I should eat. I can drink. I think this would be a great kick start to the day and probably something I can take! Perfect for on the go. I really want to try the salt and vinegar cracker chips. Bet my son would like them too! the pastry chips - they sound delicious! the pastry chips - they look delicious!